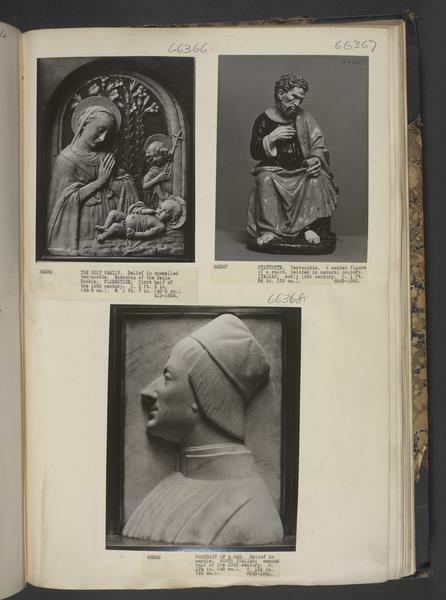 This relief is from the workshop of Della Robbia, after a composition by Antonio Rossellino. It is adapted from the figures of the Virgin and Child in the large circular marble relief of the Nativity by Antonio Rossellino in the Museo Nazionale, where the pose of the Child is determined by the curve of the circular surround. It is known in several variations which are believed to be from the workshop of Benedetto Buglioni. Benedetto was said by the famous painter and biographer Giorgio Vasari (1511-1574) to have learned the art of enamelled terracotta from a woman who worked in Andrea della Robbia's house, but he was probably active initially in Andrea's workshop. He is also known to have been employed by other sculptors and his work shows influences from a range of painting and sculpture produced by Florentine artists at the time. Similar reliefs are in the Museo Nazionale at Florence and elsewhere. The small relief was probably made for private devotion in a household. Relief in polychrome enamelled terracotta; rounded top. The Virgin half-length, turned to the right with folded hands; the Child lying before her, St. John behind Him, with hands on his breast and a cross in his arms; in the background a large cluster of lilies. The entire surface is white save for the background (blue), the lily stems (pale green), and the foreground (smudgy bluish white). Glaze of poor quality, the colours considerably blurred. Acquired in London. The relief is adapted from the figures of the Virgin and Child in the large circular marble relief of the Nativity by Antonio Rossellino in the Museo Nazionale, where the pose of the Child is determined by the curve of the circular surround. Inventory of Art Objects Acquired in the Year 1854. In: Inventory of the Objects in the Art Division of the Museum at South Kensington, Arranged According to the Dates of their Acquisition. Vol I. London: Printed by George E. Eyre and William Spottiswoode for H.M.S.O., 1868, p. 8. 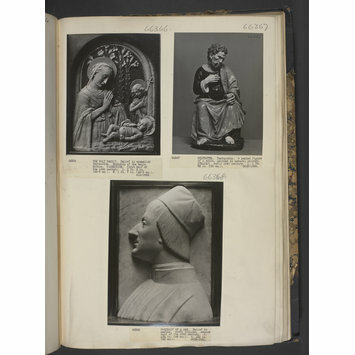 Maclagan, Eric and Longhurst, Margaret H. Catalogue of Italian Sculpture. Text. London: Victoria and Albert Museum, 1932, p. 81. Pope-Hennessy, John. 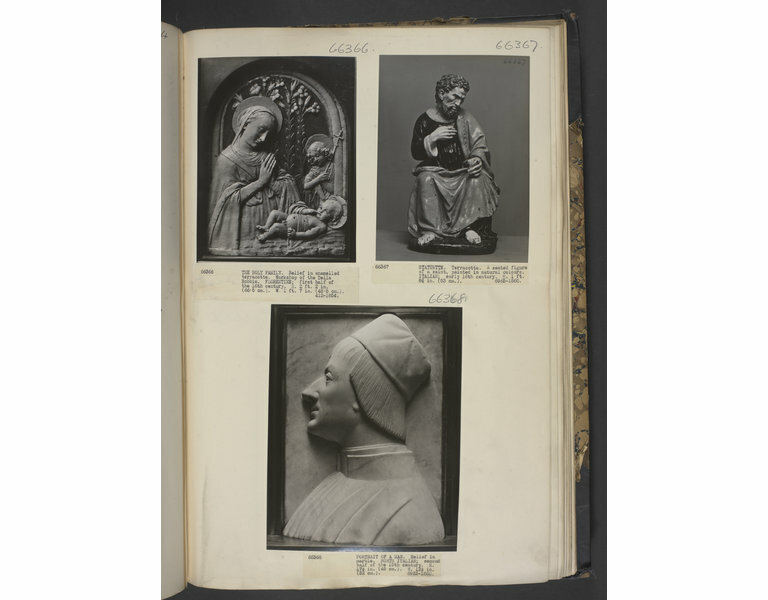 Catalogue of Italian Sculpture in the Victoria and Albert Museum. Volume I: Text. Eighth to Fifteenth Century. London: Her Majesty's Stationery Office, 1964, p. 253.